I still like The Furnace. 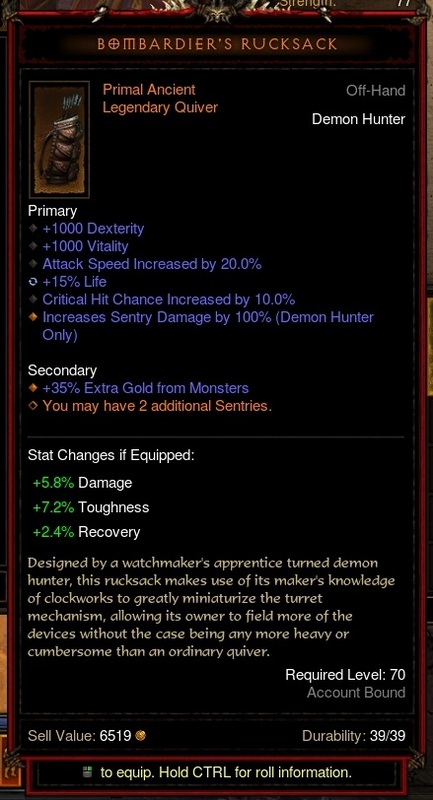 I usually cube it, but a primal one would have some nice stats. Good smashing power. Okay, that makes sense. The link above took me to a page in some foreign language. Now the same link takes me to a page in English. Okay, I give up. What it GOG? I went to the website and it's all in Latin or something. My N6M4 now has all Ancient equipment (counting the Primal Rucksack), and the "next level" is boosting them all via Caldesann's Despair. Which requires several cranked-up Legendary Gems (which means lots of Keystones) and a whole lot of regular Gems. Since she had a full UE set in the Stash, I made a UE setup for her, and have been tweaking it. Optimizing for running T13 Rifts is easier than optimizing for maximum GR level. Basically everything's focused on speed and damage, so now she flies through regular rifts one-shotting everything and collecting Keystones. Then I'll level up a Legendary Gem, boost some equipment, rinse and repeat. At the very least, this will provide some variety as I incrementally boost the N6M4 build. I'm not sure why I didn't think of this before. Probably because I still think of characters having certain builds. I keep forgetting how easy they've made it to switch builds via the Armory. Got my N6M4 Eurobabe up to GR91 over the weekend. This is nuts. Yeah, I know they've inflated all the numbers, but what the hell. I'm gonna see if I can get up to GR100 at some point, just because it seems like a nice number to shoot for. I mean, I blew past 70, at 80 it was starting to get tough, but I kept adding Paragon points and getting the occasional equipment upgrade, and eventually I hit 90. I know there are lots of guys out there doing well over 100, which is insane, but I'm neither that good nor that dedicated (obsessed) with the game. But it does seem like a worthy goal. Yeah, it's sweet. The one I have on Americas has +2 to pickup radius instead of +35% gold, but that's just being picky. Yeah, I haven't heard that since... well, let's say it's been a while. But thanks! If that looks familiar, it might be because I've got one on Americas, too, which I posted a while back. What can I say? The RNG gods love me.